Pakistani cricket team lost the 4th ODI match against Australia in UAE despite the two centuries by Abid Ali and Mohammad Rizwan. Pakistan became the first team to face defeat despite having the two centuries made by Abid Ali and Mohammad Rizwan. Pakistan Vs Australia odi series started from 22nd March 2019 in United Arab Emirates (UAE). Pakistan are ranked fifth at the ICC ODI team rankings, while Australia currently sit sixth spot. 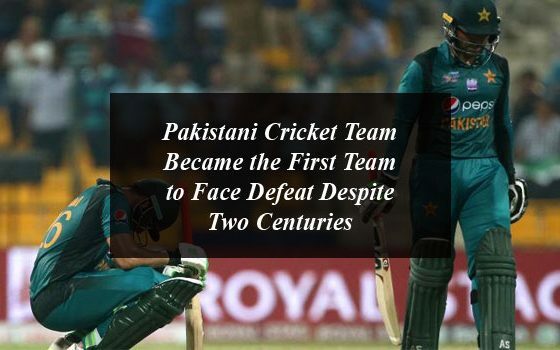 Now Pakistani cricket team became the first cricket team of the world who faced defeat in spite of making two centuries in the 4th ODI match against Australia on 29th March, 2019. According to the details, Pakistani cricketers Abid Ali and Mohammad Rizwan have scoring hundreds of runs in the fourth match of the odi matches series played in Dubai. This is the first time in a fast-track history when a team is defeated in the match despite having the two centuries by the batsmen. In the fourth match of the five-match series, the World Champions Australia won the by 0-4 by defeating Pakistan by 6 runs in the fourth ODI. In Dubai, Australia target Pakistan 278 runs in the fourth one-day match, in response, Abid Ali and Shan Masood started the innings, but Masood had already returned to the Pavilion without making a single run. Harris Sohail came and added 74 runs for the second wicket by making 25 scores. In spite of losing two batsmen Abid Ali has played well in partnership with the wicket keeper Mohammad Rizwan. Abid Ali has scored the century in the first ODI match of his career by hitting 8 times foru, with the stunning score of the series, as he became the third debut player to make hundred by Pakistani cricket team, before him Sulaimahihi (1995) and Imam Ul Haq (2017) has scored the centuries as the debutants. Abid Ali scored 112 runs with the help of 9 fours, he scored 144 runs for the third wicket with Mohammad Rizwan. Umar Akmal failed in the fourth match and failed after scoring 6 runs. Saad Ali made only 9 runs. Mohammad Rizwan scored his second innings in the series, but Captain Imad Waseem scored only 1 run, Rizvi also made 104 runs and returned to pavilion, Usman Shinwari got 6 runs. Pakistan won the toss and decided to bowl first. Aussie Finch and Usman Khawaja gave the start of 56 runs to Australia, Aryon Finch scored 39 runs, in the coming Marsh, pytrends dumb and Marcus stoinis played in double figures and the returned pavilion respectively 2,7 ​​and 5 runs scored. Usman Khawaja completed his 9th One-One half-century after which he was out of LBW on Yasir Shah’s ball, Maxwell and Alix Carey scored 133 runs for the wicket and Maxwell finished his 18th and Kerry finished the first half. McLeil could not finish his century and scored 98 runs in the last over, in his innings nine fours and 3 sixs while Elix Career went out on 55 runs. Mohammad Hassanin, Yasir Shah and Imad Waseem got 2 wickets from the national team. Two changes have been made in the team, the team comprising Saeed Ali and Abid Ali were replaced by Imam-ul-Haq and Shoaib Malik. Shoaib Malik, who performs captaincy duties in the absence of Sarfraz Ahmed’s absence, has become unfit, due to which he was not included in the team. Imad Waseem now the performing as the captain on the other hand Imam-ul-Haq was not the part of the team due to fever. 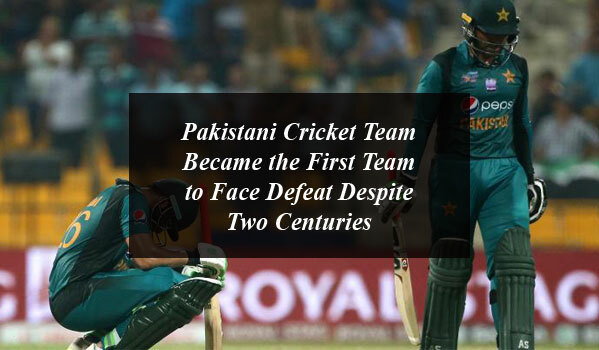 Pakistani Cricket Team Became the First Team to Face Defeat despite Two centuries. Pakistani cricket team lost the 4th ODI match against Australia in UAE despite the two centuries by Abid Ali and Mohammad Rizwan.